The Atlas was the first Intercontinental Ballistic Missile (ICBM) deployed by the USA. Its descendents are still in use today as civilian and military space launch vehicles. The Atlas development can be traced back to the days immediately after World War II, when captured German rocket and missile technology supported many new missile research studies. In April 1946, Consolidated-Vultee (later Convair) began project MX-774 to study long-range ballistic missiles. The studies led to the RTV-A-2 Hiroc test rocket, which tested several new design techniques which would later be used in the Atlas. These features included a gimballed nozzle, using the fuselage itself as fuel tank, and a separable nose cone. Altough MX-774 was cancelled in June 1947, Convair was allowed to complete three RTV-A-2 vehicles, and the first of these flew in July 1948. All three flights were only partially successful but helped a lot to validate the new design concepts. 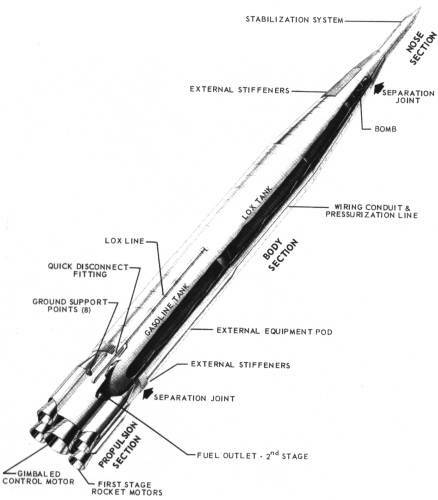 After the cancellation of MX-774, Convair continued low-key internal studies on ballistic missiles, developing the idea of the "one and one half" stage rocket. In this type of design, both booster and sustainer engine(s) would ignite at lift-off, and the boosters would be dropped later in the flight. This circumvented the difficulty of having to ignite the sustainer at high altitude, which was then considered a potential problem. When military funding sharply increased after outbreak of the Korean War, Convair was awarded a contract for the long-range ballistic missile project MX-1593 in January 1951. Later in 1951, the USAF decided to assign aircraft-like designations to its guided missiles, and the designation B-65 was assigned to the MX-1593 missile (named Atlas by this time). In 1953 Convair had completed the initial design studies. One radically new feature was the internal pressure stabilized flight structure. The missile's skin was very thin, and was inflated by internal pressure like a balloon. This significantly reduced the empty weight of the vehicle. However, it also made the missile rather fragile, because a single hole in the skin would lead to the collapse of the whole structure, just like a limp balloon. 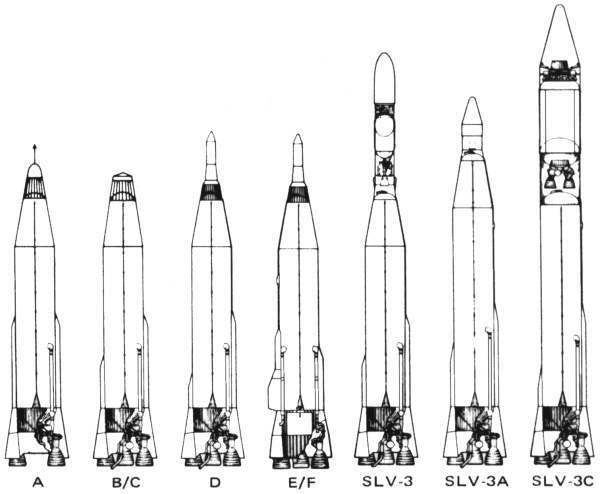 The initial Atlas design was a huge 27 m (90 ft) long, 3.6 m (12 ft) wide rocket, with five engines producing 2700+ kN (600000+ lb) of total thrust. The size was deemed necessary to launch the expected very heavy (65 ton) thermonuclear warhead to intercontinental range. Because of the limited accuracy of then available intercontinental guidance systems, a megaton-class thermonuclear warhead was necessary for the Atlas to be effective against hardened targets. A ten-year development program was approved, with an initial operational deployment planned for 1963. To minimize risk, it was decided to develop a single-engine test vehicle first, designated X-11, followed by a three-engine X-12 test vehicle and an XB-65 five-engine strategic missile prototype. In 1954, the H-bomb tests in the Pacific showed that the warhead for the Atlas could be made significantly smaller and lighter than expected. Therefore, the five-engine XB-65 design was cancelled and replaced by a much smaller three-engine design. The booster engines were North American (Rocketdyne) LR89, and the sustainer engine was a Rocketdyne LR105 enigne, both fueled with RP-1 (kerosene) and liquid oxygen. Two small Rocketdyne LR101 vernier engines were used for fine-tuning thrust and directional control. The whole Atlas propulsion system was known as MA-2. In 1955, in the light of discovering Russian ICBM activities, the Atlas development was accelerated, and it was approved to flight test preliminary prototype models which lacked some feartures of the planned production missile. The XB-65A Atlas A had only booster engines, and a dummy warhead. In August 1955, the USAF dropped all aircraft-like designations for guided missiles, and the Atlas became the SM-65. On 11 June 1957 the first attempt to fly an XSM-65A was made, but due to a booster malfunction the missile had to be destroyed a few seconds after lift-off. 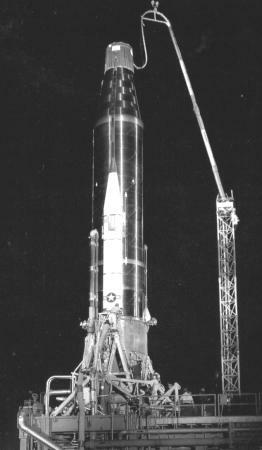 The first successful Atlas A flight to the full range of 1100 km (600 nm) was the third one, on 17 December 1957. When Atlas A testing was completed in June 1958, flight tests continued with the XSM-65B Atlas B until December 1958. The XSM-65B tested all subsystems of the Atlas, including the full three-engine propulsion system. A maximum range of 10200 km (5500 nm) was reached. The XSM-65C Atlas C, flown between December 1958 and August 1959, tested the thin-skinned fuel tanks and the radio-command guidance in production configuration. In July 1959, the XSM-65D prototype of the initial production variant, the Atlas D, first flew. 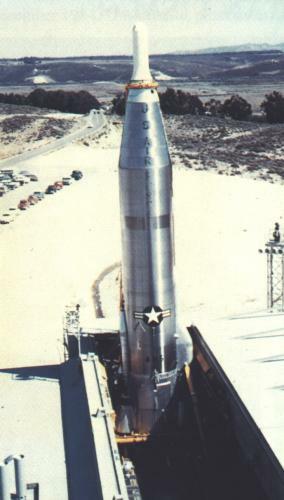 On 31 October 1959, the first U.S. Air Force ICBM squadron went on Combat Alert at Vandenberg AFB, with 3 SM-65D missiles on unprotected open launch pads. To give the Atlas at least some sort of protection, the follow-on bases were equipped with "coffins" to store the missiles. This coffin was a blast-protected building in which the Atlas was stored horizontally. Following the launch order, the roof of the coffin would slide away, the missile raised to the vertical, ready for fueling and launching. The Atlas ICBM had several significant operational shortcomings. It had to be fueled immediately before launch, leading to a high reaction time (about 15 minutes) after launch order. The fueling was also a very dangerous process which lead to several heavy explosions during operational tests. The radio-command/inertial guidance system of the Atlas D was susceptible to jamming and restricted the launch frequency of an Atlas D squadron to one missile every 5 minutes. The SM-65D used either Mk.2 or Mk.3 blunt reentry vehicles. There was also an unarmed training version of the SM-65D, designated USM-65D. The SM-65E Atlas E was an improved SM-65D. It used a more accurate Mk.4 reentry vehicle, had an improved propulsion system (designated MA-3), and used an all-inertial guidance system developed by Bosch Arma, which was originally planned for the HGM-25A Titan I. With this navigation system, located in the distinctive large bulge on the side of the missile, the Atlas E could reach an accuracy of about 600 m (2000 ft) CEP. Component testing on modified Atlas D missiles began in March 1960, and in February 1961 the first full Atlas E flight occurred. The SM-65E became operational in September 1961. Because the all-inertial guidance system did away with the necessity to launch the missile close to the launch control center of the base, the Atlas E was deployed in widely dispersed patterns. Adding also new semi-buried coffins, the Atlas E was significantly better (but still not satisfactorily) protected against a preemptive strike than the D model. The USM-65E was the unarmed training version of the Atlas E.
After the LGM-30 Minuteman had become operational in early 1963, the Atlas became rapidly obsolete. By October 1964, all Atlas D missiles had been phased out, followed by the Atlas E/F in April 1965. About 350 Atlas ICBMs of all versions were built, with a peak deployment level of 129 (30 D, 27 E, 72 F). 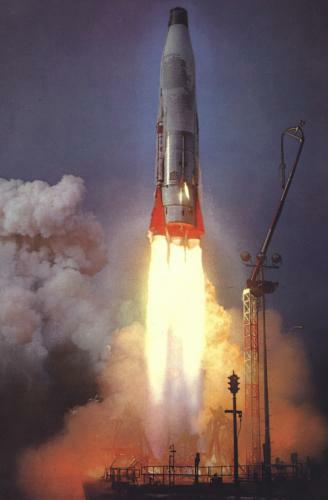 The Atlas was used as a space launch vehicle since the very beginning of the program, and Atlas developments are still used in this role in the 21st century. 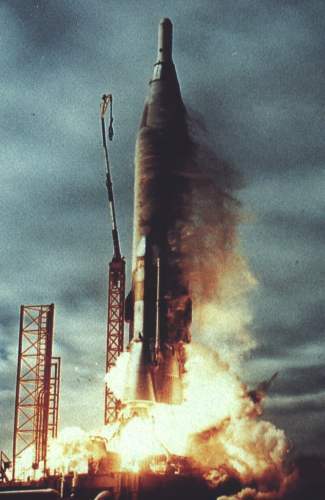 Converted ICBMs and early purpose-built space launchers, usually with additional upper stages, were used by the USAF under the basic SLV-3 designator. In 1990, the Atlas E, Atlas II and Atlas IIA/AS vehicles received the official military designations SB-1A, SB-2A and SB-2B, respectively. For details on Atlas launch vehicles, see page on SLV-3/SB-1/SB-2. Current prime contractor for all Atlas rockets is Lockheed Martin.